I started exploring development with SpriteKit. I found a perlin noise library on github and implemented a simple tile map using SKTileMap. I made it make some procedurally generated islands with trees. A few days later I discovered Apple’s GKNoiseMap, which can be configured using perlin noise or a few other types of noise. I randomly scattered some characters in the game world, and start using the pathfinder utilities to plot courses around the level. Initially I had problems getting my characters to avoid the trees. After many trials with different configurations of trees, I concluded that maybe there are some bugs in the pathfinding if the level has too many paths. I animated the characters using a chained sequence of SKActions that move and rotate. Next maybe I’ll add some on screen controls for player movement. Here is a screenshot from my platformer game in development. I’m developing it using Cocos2d. 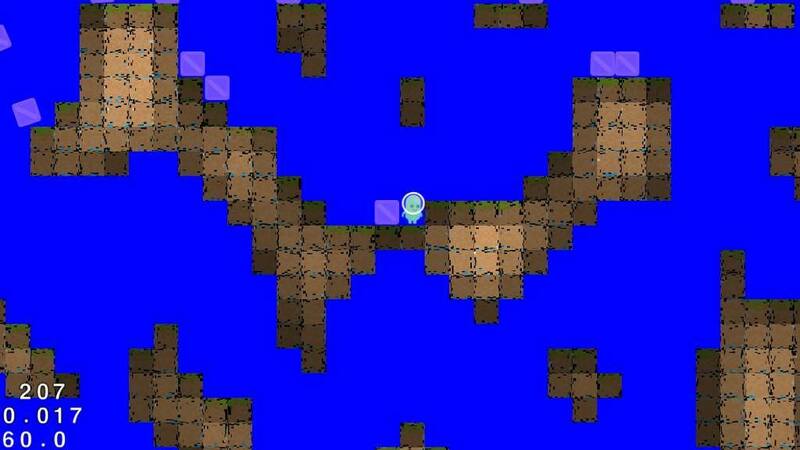 In this screen shot, I have generated a random world using perlin noise. The character can travel in any direction and new chunks of the world are generated. There is some simple shading, and a distortion shader in this screenshot. Cocos2d 3.2 was released recently, and it contains all sorts of awesome effects I want to check out. I think I’m going to use SpriteBuilder to create a new project and port my code into it, because the structure of the default project has changed quite a bit since I started working on this game. The graphics seen here are from Kenney, who makes some awesome graphics for use in game for a small donation.